The Shure MicroFlex MX418S is a fully adjustable gooseneck condenser microphone designed for podium and desktop use in speech, presentations, conferences and more. 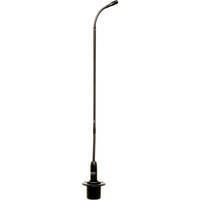 The MicroFlex gooseneck microphone series offers the flexibility of interchangeable capsule cartridges. The MX418S includes a supercardioid cartridge, which can be easily replaced with separately available cardioid and omnidirectional cartridges. In addition, the MicroFlex series features high sensitivity and balanced, transformerless output for maximum immunity to electromagnetic hum and RF interference, even over long cable runs.